In the classroom . . .
BlogGeneral HRWCIn the classroom . . . I went to Ritter Elementary in South Rockwood last week to speak to a 4th grade class. The teacher Kathy Bouren had integrated the Huron River in to her curriculum. 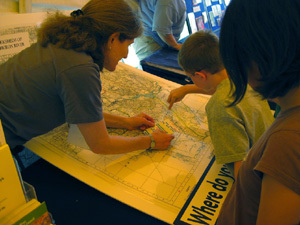 Helping students learn about the watershed. The class had read Passage to the Sea and had studied the water cycle. The school almost abuts the Huron River so the kids are very familiar with the lower Huron. I talked to them about what a river does, turning off the water when you brush your teeth, not littering or polluting, and even to avoid over fishing. Kudos to Kathy Bouren and the many great teachers throughout the watershed. Unfortunately, my talk was capped by a student throwing up (I think it was from the jars of bugs that I brought). With my own quick gag reflex, the last 1/3 of the talk was challenging as I stiffled back gags and tried to talk about the great opportunities to protect but also to enjoy the river. Who knew that a few macroinvertebrates would get such a reaction? Next time I might leave the bugs behind.